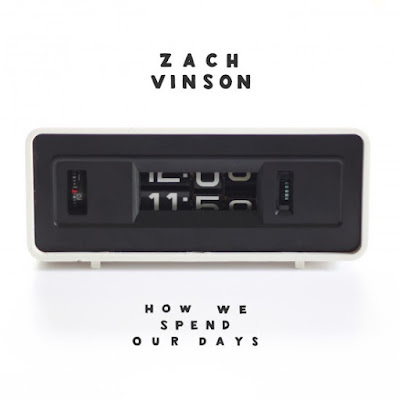 Album Review: Zach Vinson's "How We Spend Our Days"
It's been my pleasure to track the musical evolution of one of my old college pals, singer-songwriter and piano rock artist Zach Vinson. Vinson's third solo album, "How We Spend Our Days" officially releases today. And it's good. I've been absorbing its sounds and letting them rattle around inside my head for a few weeks now. The six-song album is full of wisdom and poetry about love, life, family and Vinson's Wisconsin roots. The melodies compel me to dance fast and slow, to upbeat, piano-driven "You're the One," to the gentle, acoustic guitar strains of "A Simple Verse," to the contemplative, yet joyful rock 'n' roll of "Home." I have to admit I wasn't prepared for the heavier electric and bass guitar rock elements on the track 4, "Something About the Way," as Vinson's first two albums leaned more to the pop side of the pop/rock spectrum. But the good news is, Vinson has the musical ability to flow from one set of sounds to another with skill and ease. My favorite song on the album is "A Simple Verse." It's the essence of marital affection. Words fail. Just listen and appreciate its simple beauty. Cause this year's been different than before. And I am not winning. Is there a way to know everything? To hold to when you just cannot hold on. I'm gone, but I'm not leaving. Is there is a way to know everything? Each bit of your pain, each memory you see? If you like the song I shared, you can buy Zach Vinson's third album, "How We Spend Our Days," as well as his two previous albums, "The Streets Will Turn to Streams" and "Cracked Open," at his website. To get updates about Vinson's shows and future album releases. "Like" his Facebook page and follow him on Twitter. Read more of my blog posts about music here.